A rapid, non-sedative combination of NSAID with Muscle relaxant, having anti- inflammatory and antipyretic actions with least GIT related side-effects to treat painful muscle spasms. Lornoxicam is a non-steroidal anti-inflammatory drug (NSAID) of the oxicam class with analgesic (pain relieving), anti-inflammatory and antipyretic (fever reducing) properties. It is a both COX-1 and COX-2 inhibitor. It is distinguished from established oxicams by a relatively short elimination half-life (3 to 5 hours), which may be advantageous from a tolerability standpoint. The absolute bioavailability of Lornoxicam is 90-100% and no first pass effect was observed. This proven NSAID is combined with a muscle relaxant, Thiocolchicoside with anti-inflammatory, analgesic, and anesthetic actions with minimal side effects. Rapidly onset of action is another unique feature of this drug. Although muscle relaxant have major side effect of Sedation, but Thiocholchicoside is free from sedation effect possible due to non- interference with nicotinic receptors. ●Inflammatory diseases of the joints, osteoarthritis, surgery, sciatica, and other inflammations. ●As an adjuvant treatment in painful spasm associated with degenerative vertebral disorders, dorsal pain, lowback pain, torticollis, traumatological and neurlogical disorders. Lornoxicam: Lornoxicam is a non-steroidal anti-inflammatory drug (NSAID) of the oxicam class with analgesic (pain relieving), anti-inflammatory and antipyretic (fever reducing) properties. Thiocolchicoside: Thiocolchicoside, is a synthetic sulphur derivative of colchicoside, a naturally occurring glucoside contained in the Colchicum autumnale plant. It belongs to colchicine class. It has muscle relaxant, anti-inflammatory, analgesic, and anesthetic action with minimal side effects. Rapidly onset of action is another unique feature of this drug. Lornoxicam: It inhibits prostaglandin biosynthesis by blocking the enzyme Cyclo-oxygenase. Lornoxicam inhibits both isoforms in the same concentration range, that is, balanced COX-1 & COX-2 inhibition. It is distinguished from established oxicams by a relatively short elimination half-life (3 to 5 hours), which may be advantageous from a tolerability standpoint. The absolute bioavailability of Lornoxicam is 90- 100% and no first pass effect was observed. Thiocolchicoside: Thiocolchicoside has a selective affinity for g-amino-butyric acid (GABA) receptors and acts on the muscular contracture by activating the GABA-nergic inhibitory pathways thereby acting as a potent muscle relaxant. 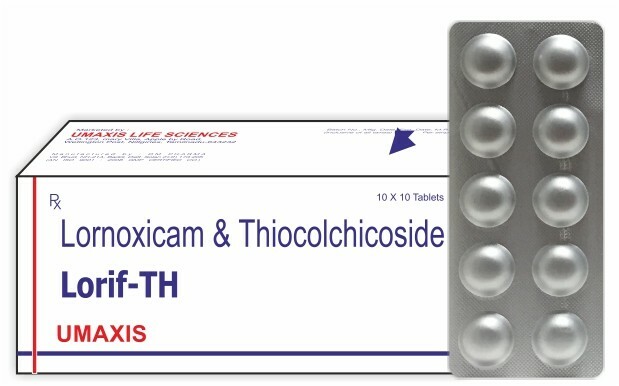 Thiocolchicoside is a muscle relaxant with anti-inflammatory and analgesic effects. It acts as a competitive GABA receptor antagonist and also inhibits glycine receptors with similar potency and nicotinic acetylcholine receptors to a much lesser extent. It has powerful convulsant activity and should not be used in seizure prone individuals. Mode of action includes modulation of chemokine and prostanoid production and inhibition of neutrophil and endothelial cell adhesion molecules by which it interferes with the initiation and amplification of the joint inflammation. Lornoxicam: Active infections, asthma, allergic disorders, haemorrhagic disorders, hypertension, impaired renal, hepatic, cardiac function. Thiocolchicoside: Photosensitivity reactions, In children and reduced dose recommended in case of diarrhea.